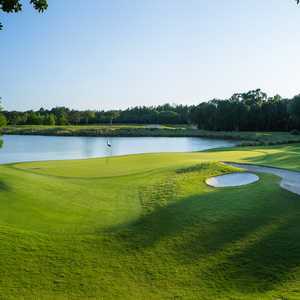 The 18-hole Marsh Creek Country Club in Saint Augustine, FL is a private golf course that opened in 1988. Designed by Mark McCumber, Marsh Creek Country Club measures 6883 yards from the longest tees and has a slope rating of 149 and a 73. Royal St. Augustine Golf & Country Club's beautiful course is located only minutes from St. Augustine, Florida’s oldest city which was established in 1565 - and like this great city, Royal St. Augustine is certain to stand the test of time. The 18-hole St. Augustine Shores Golf Club in Saint Augustine, FL is a semi-private golf course that opened in 1973. Designed by John Denton, St. Augustine Shores Golf Club measures 5659 yards from the longest tees and has a slope rating of 112 and a 67. 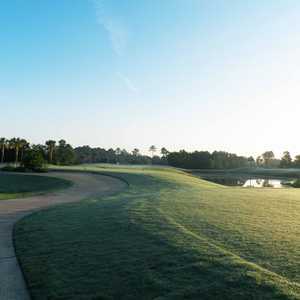 The 18-hole St. Johns Golf & Country Club in Saint Augustine, FL is a public golf course that opened in 2001. St. Johns Golf & Country Club measures 7236 yards from the longest tees and has a slope rating of 132 and a 74. An Arthur Hills design, Palencia's championship golf course meanders through hardwood forests and along marshland preserves for beautiful scenery and topography. Hole three, called "Leaning Tree," features a mature live oak whose main trunk reaches across the fairway and into the line of play.